In the previous post, we examined some configuration issues with Cloudera Manager and Hadoop services in the latest release of Oracle Big Data Lite VM (4.1.0). 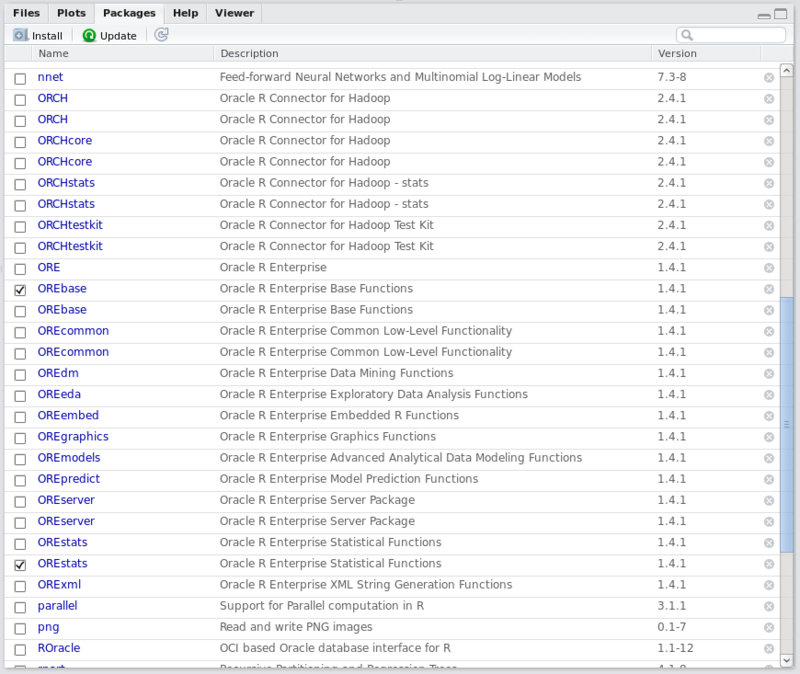 In this post we report issues with Oracle R Enterprise, and the remedies we applied. > help(ore.connect) # works OK! The first of these directories belongs to user oracle, while the second one to root (the third one is empty). Now, it takes little effort to verify that the same ORE & ORCH packages exist in both directories numbered ‘1’ and ‘2’ above, hence the duplicate entries in the RStudio package list. By default, the R command library, if not provided with a location, loads the requested package from the first directory, as listed in the .libPaths function; only if R cannot find the package in that directory, it proceeds to look for it in the rest of the directories listed. So, in our case, it turns out that the OREstats package in the “default” location /u01/app/oracle/product/12.1.0.2/dbhome_1/R/library is corrupted, while the same package in the second location /usr/lib64/R/library is OK. The reason why this is so should be obvious by now: library(ORE) loads its dependencies from the “default” directory, where the copy of OREstats is corrupted; by forcing OREstats to be loaded from the second available directory (where the copy is OK), we end up with no corrupted packages loaded and no errors. Directory $ORACLE_HOME/R/library is the one where we (i.e. user oracle) will normally download any additional packages we may need, and it makes sense to keep it separated from $R_HOME/library directory, which will contain only the R default packages, along with ORE and ORCH. 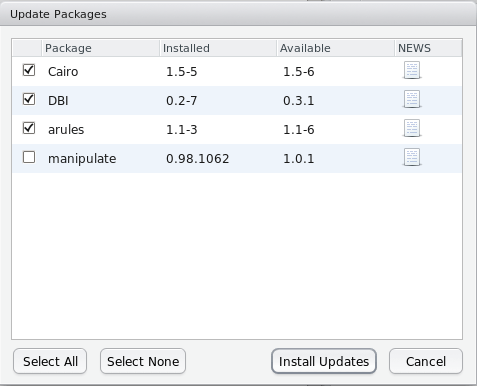 We wouldn’t like to move any more packages in $R_HOME/library, since the packages in our home directory $ORACLE_HOME/R/library are much more straightforward to update from RStudio (we’ll cover the updating of R default packages in $R_HOME/library directory in a subsequent post). Do not bother with manipulate (it needs to be in the same version with your RStudio installation, which currently is 0.98.1062), and just select the other three as shown in Fig. 3. 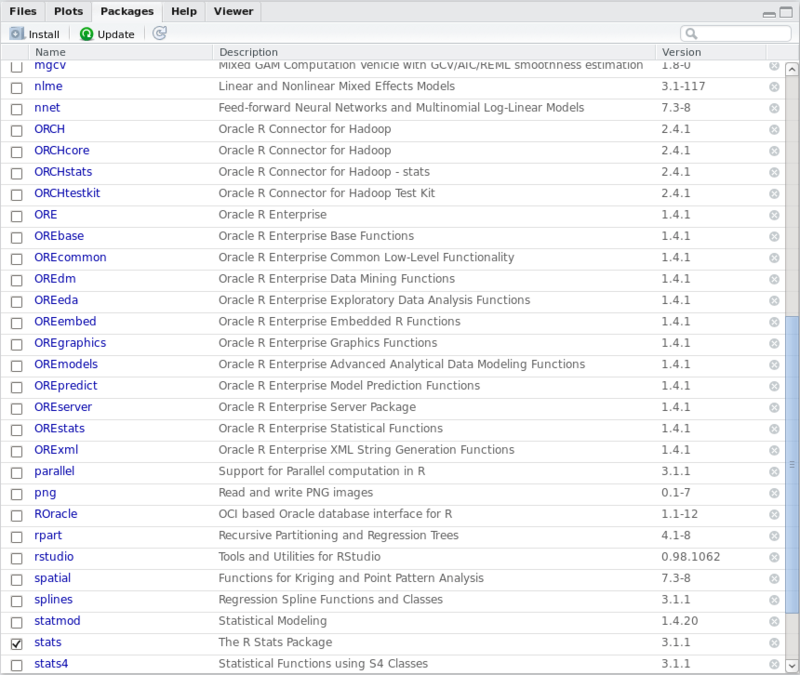 The post Oracle R Enterprise issues in Oracle Big Data Lite VM 4.1.0 appeared first on Nodalpoint. To leave a comment for the author, please follow the link and comment on their blog: R – Nodalpoint.